The shifty looking youth spotted me about the same time I spotted him. It wasn’t difficult, we were the only two around. I’d paused to photograph a wall of graffiti on my way to talk to Flo and Krazy Roscoe, an English couple living among the community of cave dwellers above Sacromonte. The youth eyed me from a street corner below. 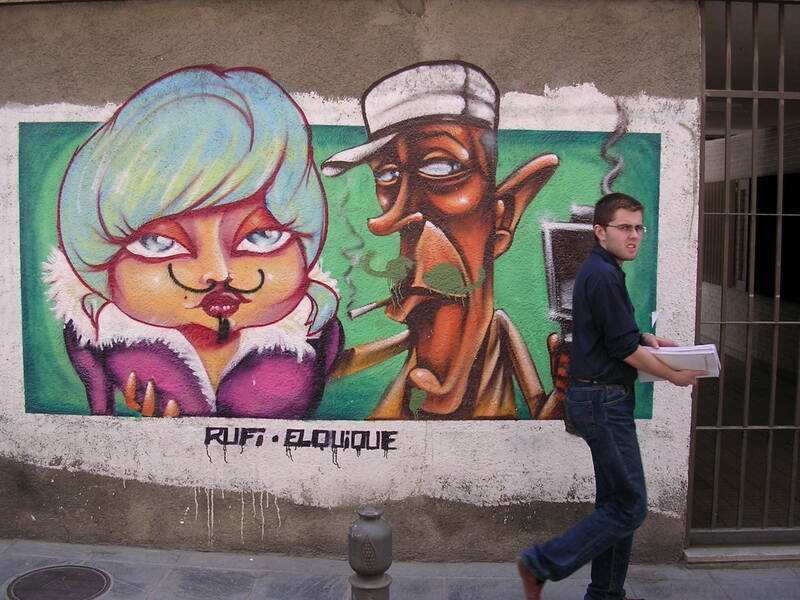 A disillusioned art graduate in the UK, Flo has been spraying the walls of Granada for more than a year. Along with a cultural history stretching back millennia, and a reputation for a lively contemporary arts scene, the provincial capital has emerged as a centre for Spanish graffiti. Artists such as el niño de las pintoras have gained international fame. From modern blocks of faceless apartments on the outskirts, to the ancient buildings in the centre, Granada’s walls are filled with murals, tags and stencils, lending the city a vaguely uneasy feel. They were the first things I noticed on the bus ride in. My camera was still in my hand when I saw the second youth. Both were in their late teens or early 20’s. Though some distance lay between them, signs were they were fellow travellers, and they were travelling my way. Not wanting to risk our paths crossing, I had to go upwards. The hill was too steep and rough with cobbles to run and, though barely midday, the heat was already stifling. The last Moorish stronghold to fall back into Christian hands in 1492, the Alhambra complex overlooks the Darro Valley at the point where the fertile plains of the province rise up to the Sierra Nevada. Long before the Moors arrived, Iberians, Romans, and Visigoths had appreciated its strategic position. But it was Muhammed I who seemed most aware of its natural beauty, and it was he who began the construction of the Alhambra in the 13th century on the hill surrounding the Alcazaba, or fortress. Building was to continue over the next two hundred years up until the end the Nasirid dynasty. 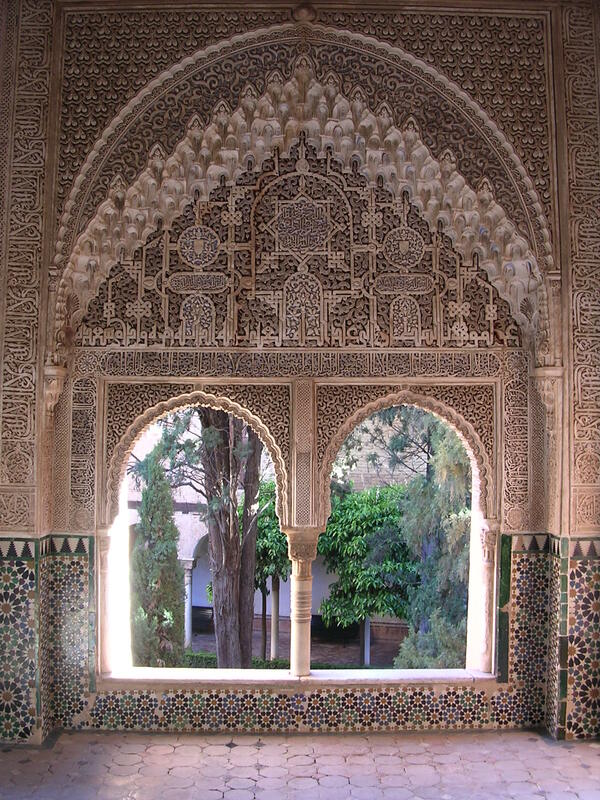 Its palaces and gardens form the most beautiful reminders of Islamic culture remaining in Europe. Remains of various civilisations are being discovered all the time in Granada. A convenient little dig in a garden some twenty feet below allowed me to stop briefly and let the youths pass by. If they were thinking to rob me it was doubtful they would attempt it in front of witnesses. When I caught sight of them again they were together, and it was already too late. My attention diverted they’d dived into a blind alley. Knowing full well they planned to come up behind me, I swivelled round. ‘Amigo,’ the first one called softly, nodding to the blade in his hand. Although short, it would’ve been honed razor sharp, easy to conceal and perfect for slashing in addition to stabbing. He grabbed my left wrist. My camera in my right hand, I held it well away, ready to smash the side of his face. We looked each other straight in the eye. For some inexplicable reason my patience ran out in that brief stand-off, and a ferocious anger took hold of me. I shouted into his face as loud as I could, ‘I don’t have anything!’ A patent lie, but there’s no time to work out what to say in such situations. Besides, it didn’t matter what I shouted, as it was in English, and doubtful he understood. My reaction seemed to take him completely off-guard. Again, I shouted, even louder. At that point tables turned. He let my wrist go. He appeared shocked, unable to decide what to do. Both youths became unnerved, looking round anxiously to see if anyone had heard. If they had, they didn’t show their faces. The youth with the blade was already in retreat as the second one came forward. I shouted the same words at him, stopping him in his tracks. He too thought better of it, and they both made a speedy withdrawal. Although I had done a very stupid thing, from their reactions my assailants were fairly new to the job, and I was the first to refuse their offer. It’s almost certain that they would’ve been satisfied with the camera, and I’d foolishly risked being knifed in broad daylight for its sake. Severely shaken, and in no mood to appreciate the panorama of the Alhambra, I needed a stiff drink. In the square behind El Mirador there are a couple of pleasant bars and restaurants. Krazy Roscoe turned up for our rendezvous a few moments later. In the coolness of their cave, within the vast outer walls of the old city, the couple showed me three rooms that had been hollowed out of the hillside many years before. They moved in after losing their flat. Without running water or electricity, most caves were inhabited by gypsies until very recently. Now they have been squatted by an assortment of musicians, hippies and artists from all over Europe. Refuge from the blistering heat of summer, and icy blasts from the Sierra Nevada in winter, they remain at a more or less constant temperature throughout the year. Older gypsies, who can remember living there as children, are happy to see them being used again. Krazy Roscoe plays guitar and sings around the squares. As she painted his guitar case, Flo talked about her work. Often highly political in content, much of it is commissioned, and much of it isn’t. Both sides of the political divide employ graffiti to get their messages across. Like just everywhere else, racist scrawls can be seen in on walls throughout Spain alongside left wing slogans, and kufic-like tags. Humour plays a large part in Flo’s work. Under cover of darkness, she sprays her anti-Bush and anti-war caricatures far and wide. Flo says that she reaches far more people that way than she ever could by exhibiting paintings in galleries. The adrenaline rush she gets from risk of discovery is also a strong motivation. I asked if she ever considered the negative effects of graffiti, such as inspiring more graffiti with little or no artistic merit. Many sprayers were damaging the facades of Granada’s ancient buildings with tags. At first, she reluctantly agreed, but later admitted that she didn’t mind the tags at all. She sees them as having spawned the whole genre. With my recent experience fresh in my mind, and my knowledge of graffiti and street robbery beneath London’s Westway in North Kensington, I couldn’t help connecting the two. Roscoe and Flo did little to allay my suspicions. Over lunch, they told me that for a relatively small city, Granada has a reputation for violence disproportionate to its size. A large section of the population is unemployed. Heroin and cocaine are easily come by in many bars. That same week an eighteen-year-old died from stab wounds he received in a brawl. 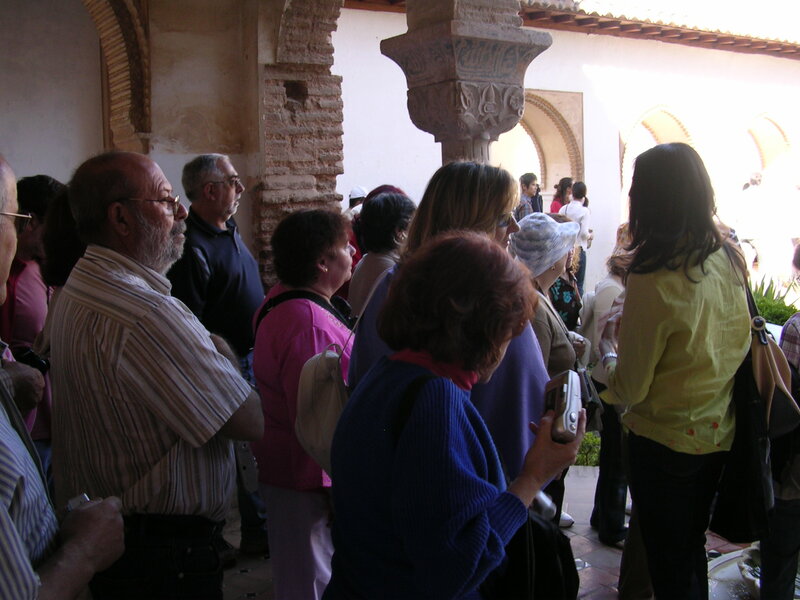 Known throughout the world the Alhambra draws thousands of visitors each day. Cities with such attractions rarely make a point of drawing attention to their downsides, and Granada is no exception. Narrow streets lined with charming old houses draw tourists, and tourists draw thieves in their many forms. Albaycín has become a stalking ground for muggers with knives. Sometimes masked, they prey on walkers making the steep climb to El Mirador. Few are so lucky as I was. 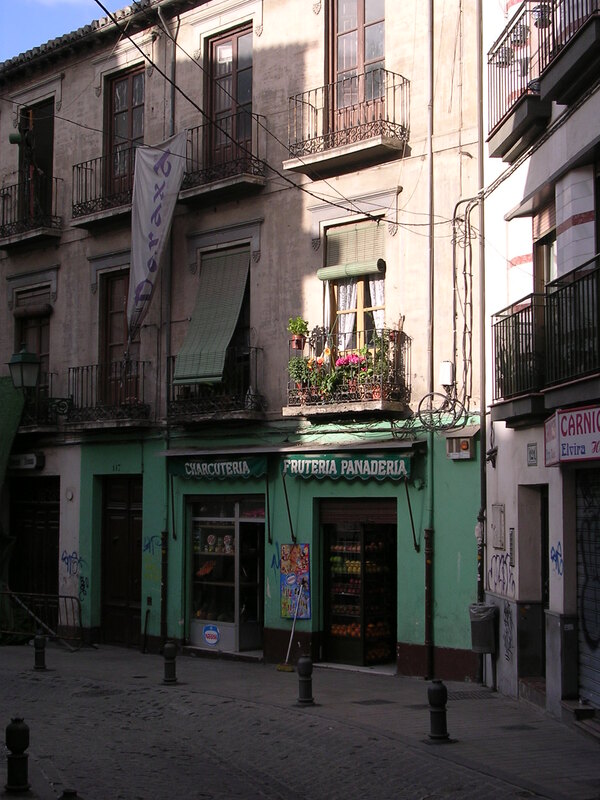 The cobbled lanes of the barrio don’t immediately strike one as the haunt of thieves, and no signs warn of the danger. It’s all too easy for them to lie in wait for unsuspecting tourists, then disappear amongst those very same narrow thoroughfares. The police are more preoccupied with persecuting hippies and gypsies than street robbers, Roscoe and Flo told me. Something I’d already seen. When I reported my incident to two motorcycles officers by El Mirador, they seemed more concerned with a couple of gypsy musicians singing for a few euros, and some hippies selling handmade jewellery, than attempted armed robbery. They told me they could do nothing about it. For those still wanting to walk up to El Mirador there are lanes that are busier and better trod than those I took, where there is little chance of being mugged. Alternatively, there is a minibus service. Needless to say, I used it on the return journey. Minibuses also make the run up to the Alhambra itself. For those who prefer to do it on foot, the walk is also steep, but safe. Passing from Plaza Nueva up a narrow shopping street, it takes you under another arch and into wooded parkland. Be warned: the palaces are busy nearly all year round. If you haven’t booked well in advance you’ll be lucky to get in. A limited number are available on the day for those arriving well before opening time to join long queues. The gates to the ticket office open at eight and the first visitors are admitted to the Palacios Nasiries at eight-thirty. At that time of morning the hordes of guide-led tourists haven’t had a chance to gather, and you can see a bit of space between the figures snapping cameras at everything that doesn’t move, and stopping anything or anyone that does. If you don’t have a ticket, entrance to most of the grounds surrounding the palaces is free. Alhambra translates from Arabic as the red one, and refers to the colour of the mountain it was built on. The oldest part of the Alhambra, the Alcazaba, was begun in the 9th century. Least well preserved, the fortress has some of the best views of Granada. The Generalife is the site of the renowned gardens. Not as well tended as they might be, they are now pleasantly unkempt, and must bear little relation to the gardens they would have been under the sultans. The imposing Nasir palaces retain some of the finest surviving examples of Islamic art in the world. Carlos V was so impressed he built his own renaissance palace within the walls, which now houses the Alhambra Museum and the Museum of Fine Arts. From a modern day western perspective, it seems ironic that some of the greatest preserved Islamic archaeological remains should be in Europe, yet the Moorish period is now recognised as one of Spain’s most culturally rich. Christian, Jew and Moslem lived side by side in harmony. They mingled and sometimes intermarried. In this liberal atmosphere the arts and sciences flowered. 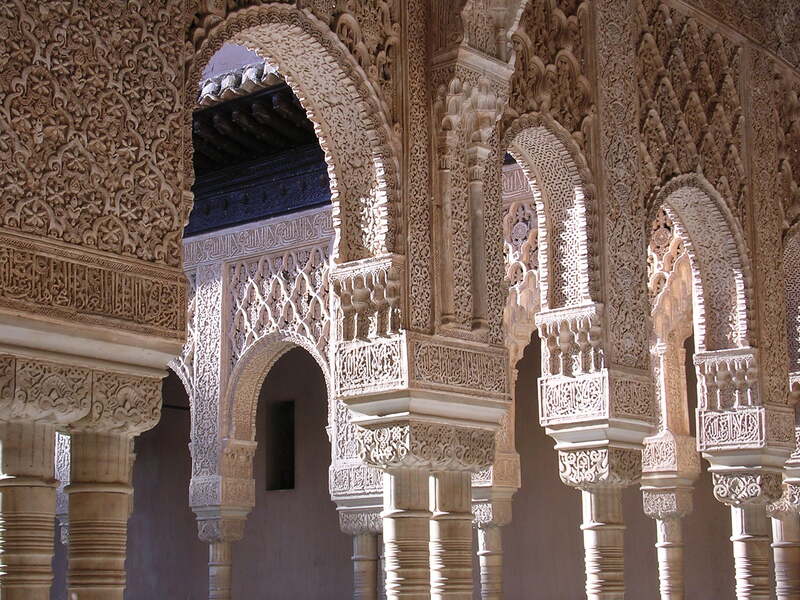 Granada became a great centre of learning for the whole Islamic world. Moorish rule lasted more than 275 years in much of the Iberian Peninsula, and went on another 200 years in the province of Granada, the last to fall. As internecine squabbles began to tear the Nasirid dynasty apart the Catholic invaders stood by and waited. Things couldn’t have worked out better for the Spanish king, Ferdinand I, whose forces began their invasion of the weakened province towards the end of the 15C. After an eight month siege King Boabdil finally surrendered the Alhambra. By the time he handed over the keys of Granada in return for a chest full of gold pieces and safe passage to Morocco on January 2nd 1492 – thus ending all Moorish rule in the Iberian peninsula – Spain had already begun of a period of great change. It was the year Christopher Columbus sailed to America from the north-western Andalucian port of Palos near Huelva, opening the door for the Hispanic colonisation of Central and South America. This enabled the vast wealth of the Aztec and Inca Empires to be plundered. For a short period Spain became the richest and most powerful nation in the world. Against this background of change, the Inquisition had started in Seville in 1481. The Christian faith was on the verge of cleaving in two as Protestantism emerged in the states of Northern Europe in the 16C. It was this event that inspired the Spanish clergy further to root out all potential opposition. Despite a promise made to Boabdil, that Moslems would be allowed to continue to practise their faith unhindered, most remaining Moslems and Jews were forced either into exile or to recant under torture. From centuries of living under the enlightened regimes of Moorish Islam, the Spanish people had entered one of the most shameful periods of their history. Nevertheless, so deeply embedded in the national consciousness, as to go virtually unnoticed, Moorish influence lived on in Spain. It can be seen in the architecture across the ages and carries through to this day. It can heard in the language and music, particularly in Andalucia. And though none are so well preserved as the Alhambra, there are Moorish ruins and remains in most large towns and cities. I wondered whether graffiti and street robbery posed great problems to the Moors. My impression is of a society too economically sound to warrant much crime, and tolerant enough not to generate religiously or politically motivated dissension. Nowadays, much of the information we westerners read about Moslems gives a distorted perception of one the great creeds of the world. The Moors’ open-minded attitude to race and religion could teach us all a lot. Too often we are presented with a picture of intolerance and oppression. In order to appreciate the positive achievements of Islamic civilisation over the centuries, and understand better events of today, perhaps we from Christian, Moslem and Jewish European backgrounds should all visit such sites as the Alhambra at some time in our lives. Only then might we be able to appreciate the complexities of the world we live in, and respect its rich diversity. Only then might we learn that it’s possible to live together in harmony. This article was written in 2005. 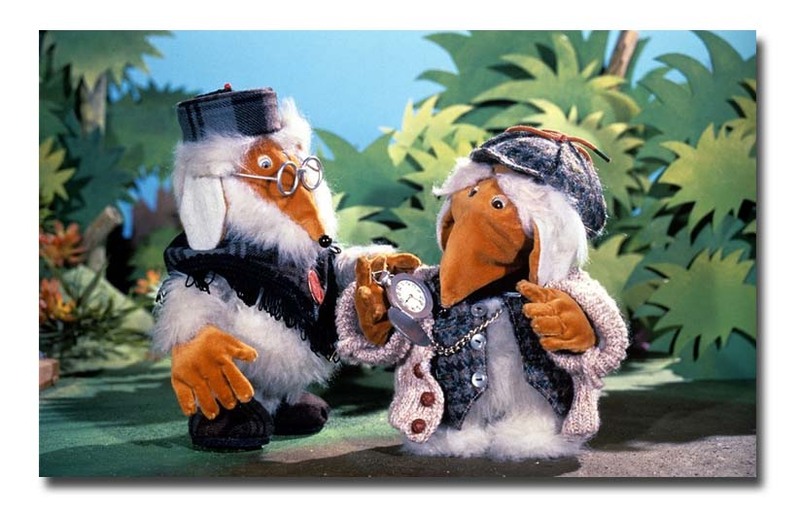 Flo and Krazy Roscoe returned to England long ago. The caves have been evacuated, as another bit of bureaucracy dictates how people should live today. As though thousands of years of evidence wasn’t good enough proof to show the caves were fit to live in. Though the graffiti has undoubtedly changed, the historical part of the city is still much the same, I hear. You had my heart racing over the encounter with the would be thieves. Glad that had a happy ending. 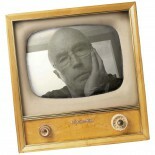 Well, the best thing for me is that I´m still around able to tell the story…. did I ever tell you about the time I was in Yerevan, Armenia, surrounded by the local mafia? No! You like to live on the edge, don’t you!